After 18 years and 125,000 miles (expertly maintained by Kevin and Steve at Foreign Affair in Santa Clara), I had to say goodbye to my gorgeous third generation Civic S. This is the rare gray/silver two-tone with the Wolf OEM alloys, a sleek dolphin of a car, the classiest city car Honda (or any manufacturer) has ever sold in the USA. When I see it parked at night, the gray reflecting the bright lights of the city, the silver underbody lightening its appearance, yet the black rubbing strips outlining a Platonic ideal of rectilinear space, my heart is full, I cannot speak. It fills its space perfectly, tranquil, an object of perfect grace and poise, a singular pearl. 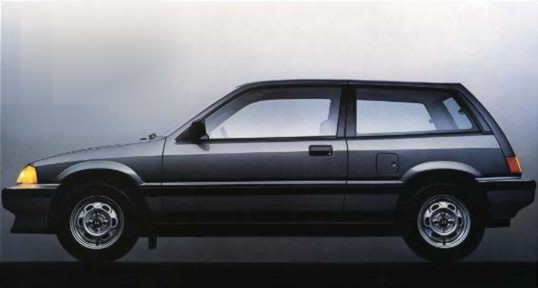 Whoever designed that Civic generation and married it to that paint selection (was it Kawamoto of Honda?) is undeniably a genius. I don't have garage space for the car, so I couldn't keep it pristine. So I prepared it for its close-up, had Bob Hsiang take some final photographs, and reluctantly sold the "S" car it to "Dolphin Dave". 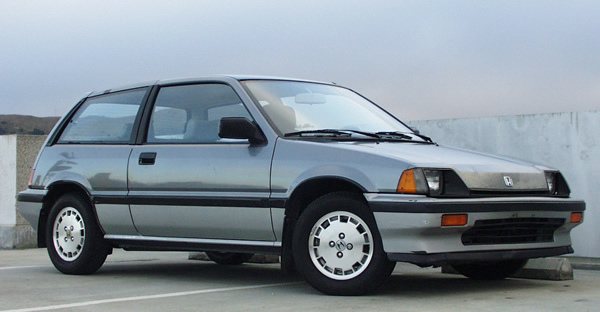 In several years this has been on this Web site, I've never heard of a Civic '84 "S" model in better shape. I bought nearly all the options available when I purchased it: air conditioning, black wheel arch and door trim, floor mats. I replaced the driver's seat with a Recaro and installed a Sony radiocassette and aftermarket aerial. Foreign Affair mounted a center rear brake light from the '86 Honda Civic. Alas, it had some body damage on the driver's side and when the front panel got dented years ago it was resprayed badly and the paint was bubbling. Plus normal wear and tear on an 18-year old. Pay Autobahn body repair enough $$$ and they'll make it great.. I offered it for $1000. Dirt cheap for an all-time classic, or an acceptable price for a city runabout that is only 12 1/2 feet long. Either way there was a lot of interest. Check back soon for some primo Hasselblad medium format B&W shots from the photo shoot. 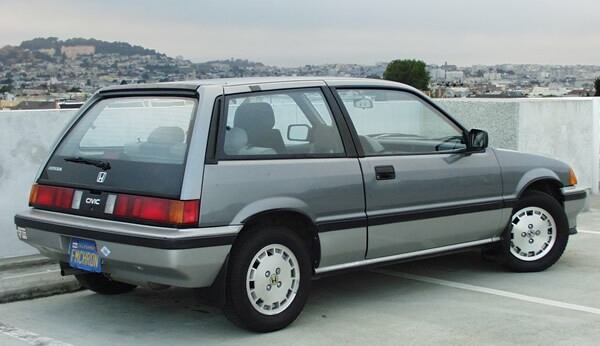 you have an absolutely perfect gray 1984-1988 Civic S for sale. Love your car, but live your life so you can walk to work.